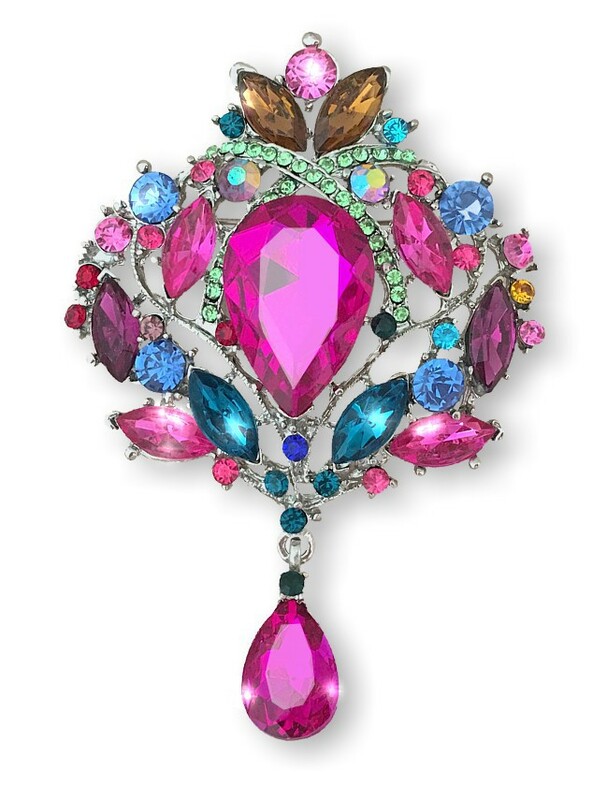 There’s something utterly regal about this spectacular brooch. Designed to breathe life into any outfit, the colours of the rhinestones are a dynamic combination of hot pinks, turquoise, royal blue, emerald, gold, amethyst and topaz and there is a band of shimmering pale mint crystals that forms a kiss over the entire arrangement. Perfect on lapels and pockets and designed to form a dramatic centrepiece at the neck of a dress or top, this is a brooch designed to be enjoyed on a daily basis, because it’s big, bold and incredibly beautiful. Finish: Antique gold tone,. Size. 9.4cm (3¾”).